Or that’s what I remember my cheese-making teacher at the Institute of Urban Homesteading saying years ago when I first ventured into the world of homemade cheese. By hard cheeses, she was referring to cheeses like Swiss or Gouda or Parmesan — as opposed to ricotta, feta or mozzarella, which we were learning to make and which, in fact, I’ve found quite easy to get right since then. Ruby told us to succeed at all the easy and soft cheeses at least five times before trying to make hard cheese, and now I’m grateful for that advice. Had I tried my hand at making something like Gouda without having first mastered the basic cheese-making techniques, I would probably have failed and become so discouraged I would have abandoned the whole thing. But here we are today with my first-ever cheddar and gorgonzola cheeses. I made them in September, so they’ve been ripening for over three months, and today was the day when I decided to taste them. To tell you the truth, I was prepared to not be happy with the results… After all, those cheese disks have just been sitting there for three months and, well, who knows…? But in the end, both turned out really quite good. 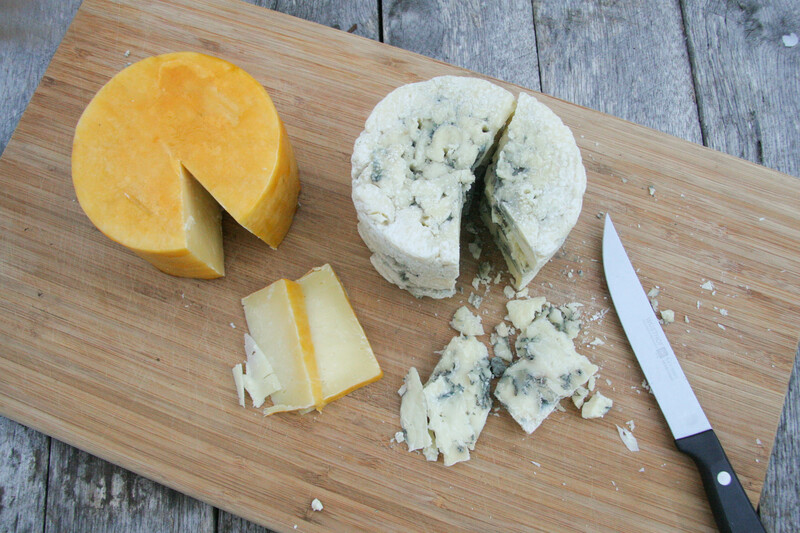 The cheddar tastes like cheddar, and the gorgonzola tastes like gorgonzola. If anything, both were a little too dry, which means I need to adjust the humidity in my cheese ripening refrigerator. But, people: the cheddar tastes like cheddar, and the gorgonzola tastes like gorgonzola! Dan and I proceeded to have a little spontaneous cheese and crackers party while listening to Christmas music, and the fact that my cheddar-loving husband consumed by himself a respectable chunk of my cheddar marked the victory of the month for me. So what is it about making hard cheeses that is “hard”? None of it is insurmountable, really. I certainly don’t want to discourage anyone from embarking on this venture — on the contrary, I would want everyone to experience the rewarding moment of tasting your own cheese after months of waiting! All I’m saying is that it takes time and patience, and you have to be prepared for a bit of a learning curve. With each of the hard cheeses I’ve made so far — most recently, the Parmesan pictured above, fresh from the cheese press and ready to go into the brine — I had to set aside several hours of the day for the process: warming up milk to a certain temperature, adding the starter culture, then waiting while keeping the milk at target temperature, then adding rennet and waiting some more, then cutting the curds and again waiting, very very slowly and carefully heating the curds, then ladling them into the cheese press and pressing the curds under various prescribed amounts of pressure for 15 minutes, then 2 hours, then 12 hours, and so forth. But you follow the instructions step by step and eventually you get to the point when the active part of the process is done and you can begin waiting for the ripening to be over. I’ve found Ashley English’s Home Dairy to be a user-friendly beginner’s cheese-making book. 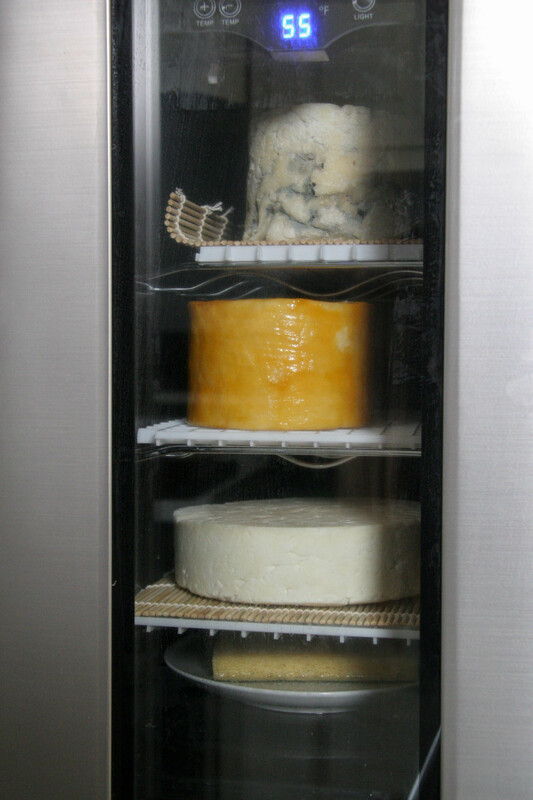 Homemade cheeses ripening in the tiny wine fridge. From the top: gorgonzola, cheddar, and (newly made) Parmesan. 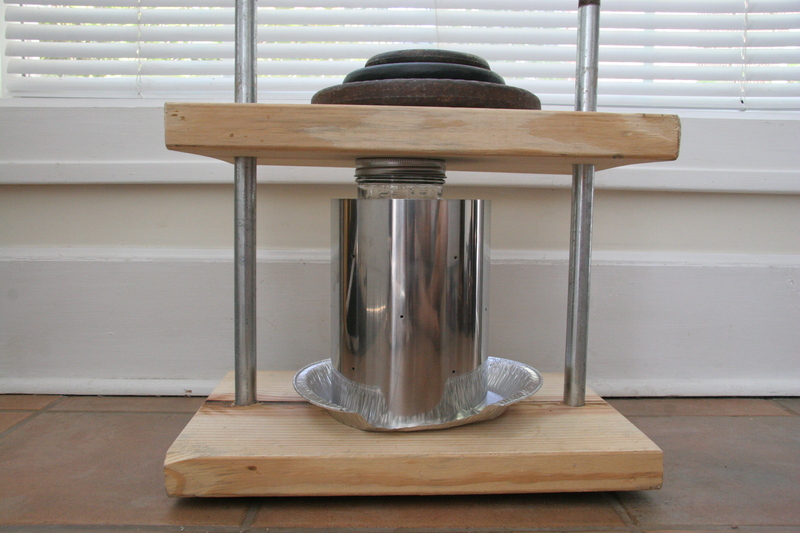 As I wrote in my post about the DIY cheese press, making hard cheeses requires acquiring two more specialized pieces of equipment: a cheese press and a ripening refrigerator. The first one I made myself and the second one I got cheaply on Craigslist, so neither one was a major investment. The fridge I use is a small wine fridge, with a thermometer and hygrometer inside to monitor the temperature and humidity, and a tray with water and a sponge at the bottom to help maintain the required humidity. As I learned, I need to figure out a way to increase the humidity to keep the moldy cheeses, like gorgonzola, nice and soft. But otherwise this setup has worked. 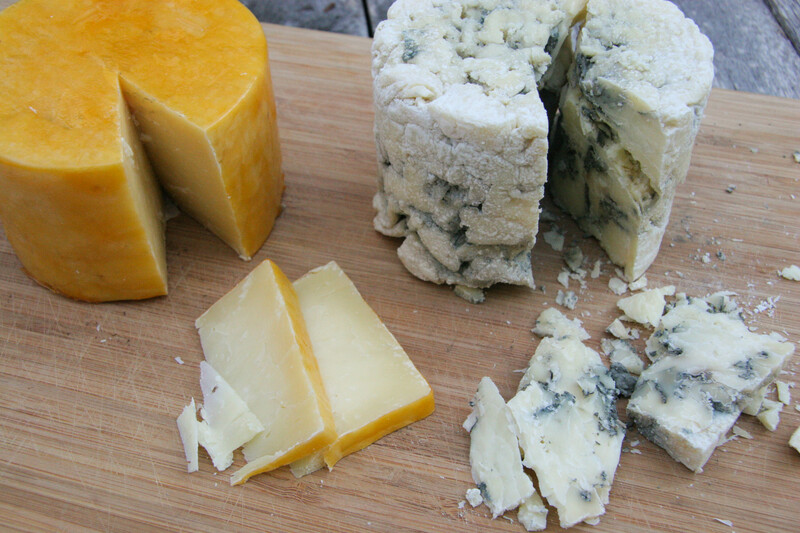 Some cheeses, like cheddar, also require a wax layer as a protective membrane on the cheese rind to protect them from mold. I got the wax, like most of the other supplies, from The Cheesemaker. The didn’t like the idea of applying the hard wax directly onto my cheese — even though it’s food-grade, it’s still petroleum-based — so I used a non-petroleum cream wax instead. But it’s possible to first do a layer of cream wax and then the hard wax on top, and that’s what I’ll try next time. For right now, though, I think I’ll just enjoy these treats for a while. Well done, those are some nice looking cheese! 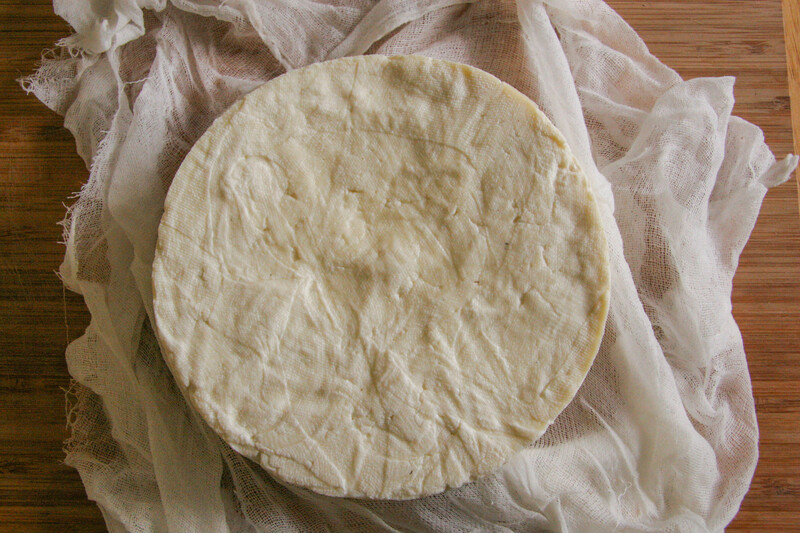 My very first hard cheese is in my press as I write… so ing to wait to know whether it’s worked though. Yours look great! Thanks! And may your cheeses be successful!